Note: When you order a selected size Ultra Allergen Filtrete filter, it will automatically be upgraded to the Filtrete Ultimate Allergen series at no additional charge. Please see the chart below for the filter sizes available for upgrade. Live healthy and enjoy the air around you with the Filtrete 1500 Ultra Allergen 6-Pack replacement air filter designed for allergy sufferers in your home. You need to know that the air inside your home can be upwards of 100 times more polluted than outdoor air, according the EPA. That means we need to be proactive and fight for control of our indoor air quality. But how did it get so bad? After the energy crisis in the 1970s homes were built differently. Our windows and doors now form a tighter seal when closed. There are fewer gaps in our attics and basements. This saves us on energy costs but also means the same air full of pollen, pet dander, smoke, bacteria and viruses among so many others are recirculated, over-and-over again. Do you suffer from allergies? Common symptoms of poor air quality range from congestion, coughing and sneezing, to headaches, trouble breathing and even asthma. We can't tell you this filter will solve all of your issues overnight, but it is going to help. When you run your air conditioner the air inside your home moves. This air will eventually be pulled into the electrostatic charged filter media where these airborne particles less than 1 microns in size that cause allergies are captured. In addition to replacing air filters as recommended, regularly clean surfaces, vacuum, and limit the amount of smoke produced from cooking or smoking tobacco, and soon you can free yourself from the burden of bad air quality and start to breathe easy. This allergy air filter lasts 3 months and meets the American Lung Association Health House Indoor Air Quality Guidelines. MPR or Microparticle Performance Rating represents the effectiveness of a filter at capturing the smallest airborne particles measured in the industry standard test. This Ultra Allergen filter received MPR 1500. Merv 11. 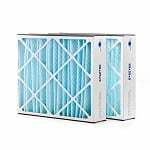 The 1" Air Filters MERV 11 -Case of 6 Filters (Better) is an economical alternative if you're looking for a quality air filter without paying a premium price. Filters Fast home air filters come in a variety of sizes and are a cost effective upgrade from simple fiberglass or poly pleated filters. 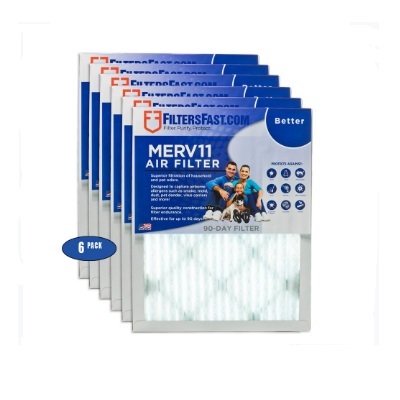 The Filters Fast MERV 11 air filter is equivalent to the Dupont Gold, Dupont Platinum, Dupont Maximum Allergen, Dupont ProClear Allergen Air filters, Filtrete Ultra Allergen Filters and many other top name brands and is available at a fraction of the cost. 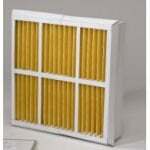 These 1" air filters filters are available in both a MERV 8 and MERV 11 rating. MERV, or Minimum Efficiency Reporting Value, indicates when a filter will be least efficient. Higher MERV ratings indicate more efficient filters. Most fiberglass spun filters, such as those found in your local grocery store, are usually only a MERV 1 or MERV 2, which can affect the efficiency and air flow of your heating and cooling system, causing it to work harder to produce the same air flow and costing you more money! These MERV 11 filters effectively reduce pollen, dust, pet dander, mold spores, dust mites and other allergens from your indoor air. Removing these airborne particles can help improve allergies and alleviate sinus irritation that can cause watery eyes, itchy throat, coughing, and sneezing. The MERV 11 filter media is electrostatically charged and constructed with spun micro-fiber that also will not retain moisture, which can lead to microbial growth. Aside from the health benefits, these HVAC filters will also extend the life of your heating and cooling system by making it work more efficiently. 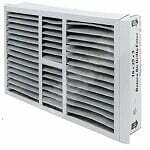 These HVAC filters feature 18 pleats per linear foot for greater surface area to catch airborne particles. These allergy air filters should be changed every 1 to 3 months for optimum performance. 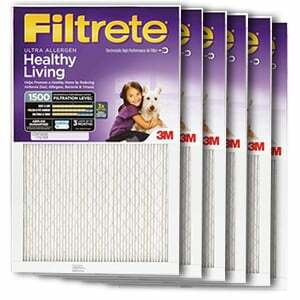 Please note that Filters Fast Air Filters sizes listed are nominal sizes. The actual size of the filter will be smaller than indicated. For example, if you select a 25x25x1 air filter the actual size of the air filter you will receive will be 24.75x24.75x.75. Listing nominal size instead of actual size is an industry standard for most air filter brands, so if your current filter says 25x25x1, in most cases, this will be a nominal size. In some older homes, and in other cases, you may require the actual size. If you require the actual size you will need to place a custom order with a representative. If you are unsure whether you need actual or nominal size simply measure your air filter before placing your order.